It is here! The much awaited Friendly Frolic release from Simon Says Stamp is now available now at Simon Says Stamp Store. I have project to share using one of the new products from the release. 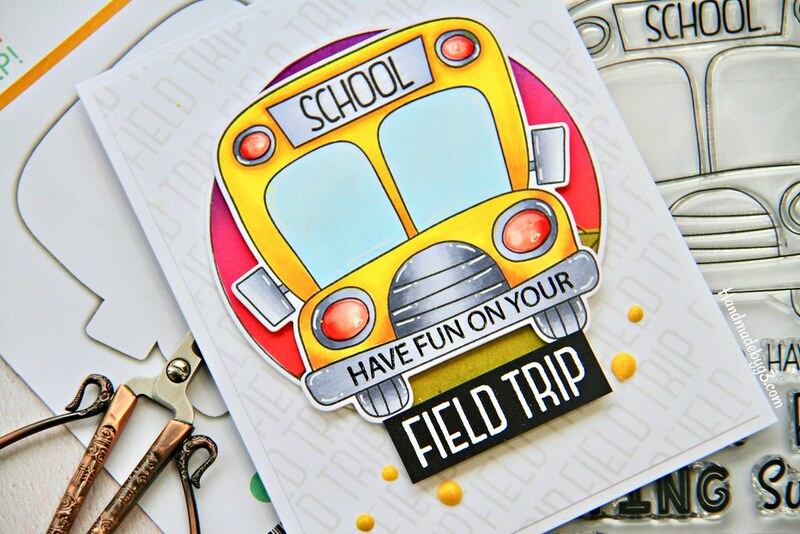 This School Bus stamp set is one of my favourite in the release because of that adorable school bus. 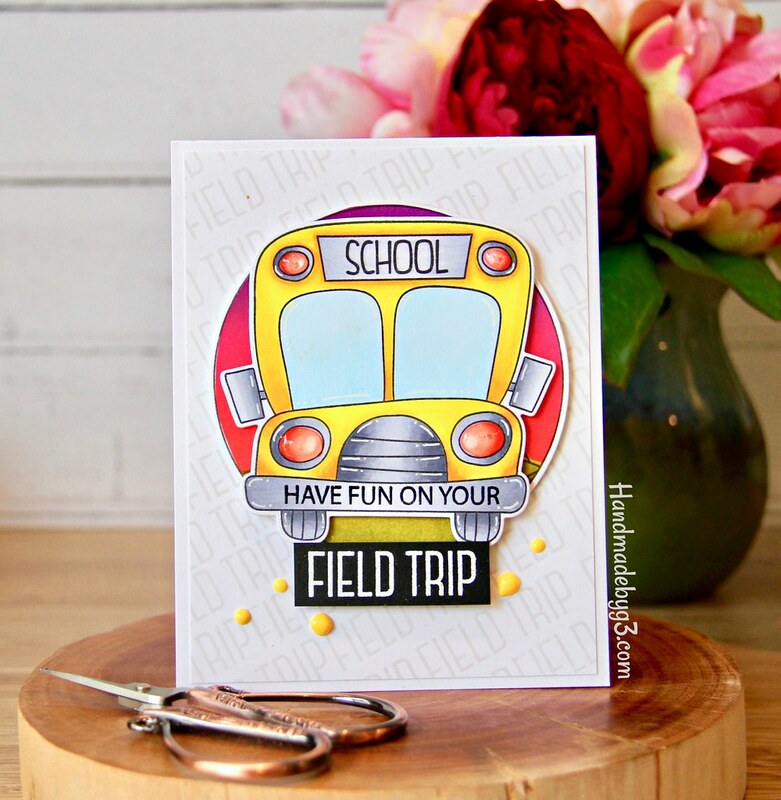 How cute is that school bus image? The school bus image also has coordinating die. How cool is that? C’mon! I was so excited when I saw this stamp set and die. I had to stamp and colour the bus and make a card. So here it is. I used Simon’s intense black ink to copic colour the bus then die cut using the coordinating die. I also stamped one part of the sentiment on the bumper of the bus and added highlights to the coloured image using Gelly Roll white pen. 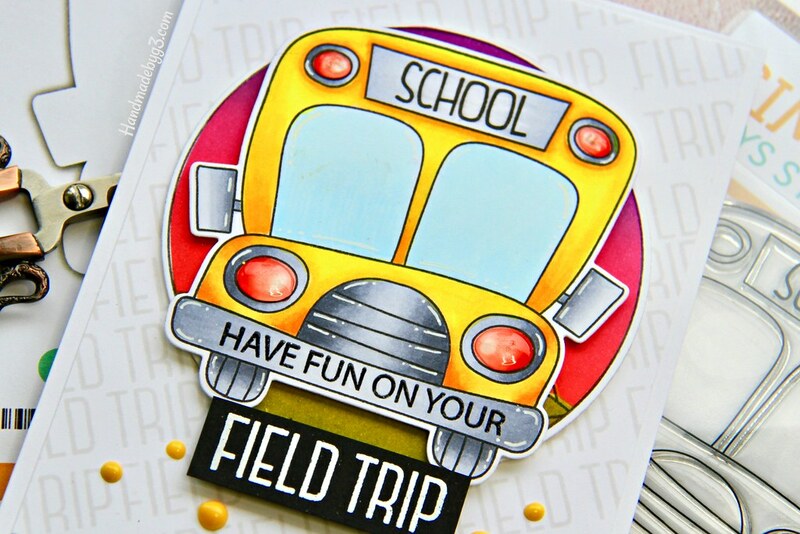 I stamped the background panel with the ‘field trip’ sentiment using Simon’s Fog ink. I still wanted something in the back of the bus to make it pop from the background. So I used the circle image from Surf’s Up stamp set and die from Good Vibes release. To add colour, I masked parts of the image and sponged distress inks. Then I die cut the circle background image using the coordinating die. I mounted circle on the background panel using foam adhesives, the school bus image on top using foam adhesive again. The second and main sentiment I white heat embossed on a strip of black cardstock and adhered below the bus image. To finish off the card, I added glossy accent to the bus headlights and a few yellow Nuvo crystal drops. Adore the school bus image. Cannot stop saying it. lol! All the supplies I used to make this card are listed below. Here are the complete Friendly Frolic collection for you to shop. These are affiliate links at no cost for you. I just wanted to tell you that your card is adorable! This is so cute, I love it!! I love that you stamped Field Trip as your background.